The finalists are in for the Natural History Museum’s 2016 Wildlife Photographer of Year competition. From inquisitive fox cubs and invisible fish through to termite tossing birds and courting cuttlefish, this year’s crop is guaranteed to astound. The latest wildlife photography competition was the most competitive to date, with nearly 50,000 entries submitted by both professionals and amateurs across 95 countries. Finalists were selected for their creativity, originality, and technical excellence. The NHM will announce the winners on October 18, but these 11 photos are some of our favorites. A bat emerges from its roost in a derelict house in Salamanca, Spain, to go hunting. The photographer positioned his camera precisely so that it was level with the bat’s exit through a broken window and the exact distance away to capture a head-on shot. The tiny linnet bird as spotted in Bulgaria’s Rila Mountains. From the florets that were ripening, it pulled out the little seed parachutes one by one, deftly nipping off the seeds and discarding the feathery down. Using the tip of its large beak-like forceps, a southern yellow-billed hornbill flicks a termite into the air and gobbles it up. This bird was spotted in South Africa’s semi-arid Kgalagadi Transfrontier Park, where it was seen eating termite after termite for nearly an hour. A pair of giant cuttlefish engage in courting behavior (female on left, male on right), while a trio males swim dejectedly in the background. 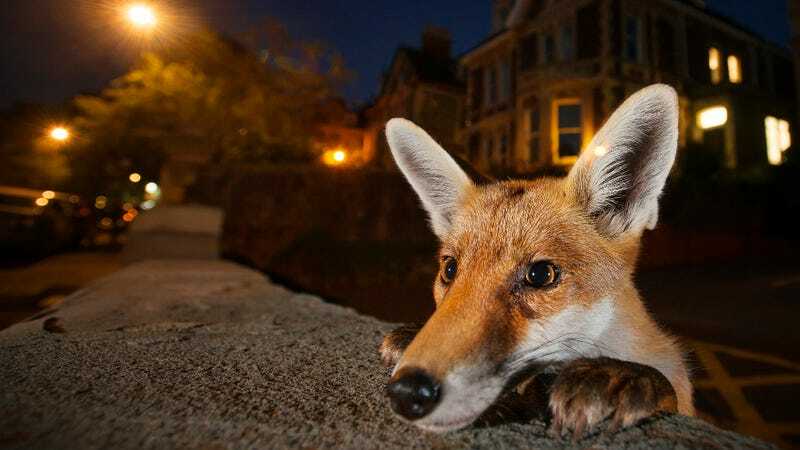 An urban red fox peers over a wall in a suburban street in Bristol, UK. “I discovered a wall that he liked to sit on in the early evening,” noted the photographer Sam Hobson. “He would poke his head over for a quick look before hopping up.’ Setting his focus very close to the lens, Hobson stood back and waited. He was rewarded when the fox cub peeked over and, apart from a flick of his ear, stayed motionless for long enough to create this endearing photo. A lion is seen playing with a Temminck’s ground pangolin, a nocturnal, ant-eating mammal with armor-plated scales. The creature curls up into an almost impregnable ball when threatened, which seems like a really good idea in this case. A chaotic swarm of mayflies as seen over Hungary’s Raba River. The lookdown fish—a name it probably gets from the steep profile of its head, with mouth set low and large eyes high—is a master of camouflage. It uses special platelets in its skin cells to reflect polarized light (light moving in a single plane), making itself almost invisible to predators and potential prey. The endangered Gee’s golden langur as seen on the tiny man-made island of Umananda in Assam’s Brahmaputra River. Only 2,500 mature adults still exist in the wild. This photo was selected as finalist in the “10 years and under” category. A large male orca whale is seen feeding on herring that have been squeezed out of a fishing boat’s closing fishing net. The photo was taken in Arctic Norwegian waters. A lava flow as seen on Kilauea on Hawaii’s Big Island. In this extraordinary image, the lava is being flung some 100 feet (30 meters) into the air. The photographer, Alexandre Hec, was just 328 feet (100 meters) away when it happened.